Did you know that over 94% of waste in a typical office bin is recyclable? Yet, according to Planet Ark, the recycling rate for commercial and industrial waste is only 60%. This means there’s still a long way for businesses to go. However, a worrying 68% of SMEs think they are already doing all they can with regards to waste management and recycling. If your business is serious about corporate sustainability, initiating a recycling program is a great way to close this gap. 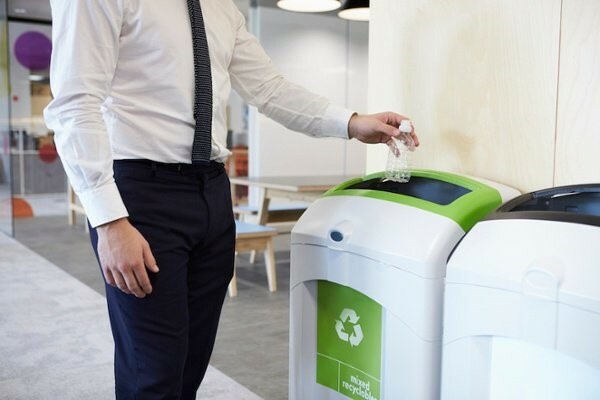 A corporate recycling program is an important means of formalising the business’s commitment to the environment, providing clear guidelines for employees to follow, and quantifying the business’s success in cutting down waste. Plus, it’s good for the bottom line too. Let’s look at some of the benefits of implementing a corporate recycling program. By taking measures to not just recycle but also reduce overall waste, you can help lower costs. For example, you can reduce paper consumption by enforcing double-sided printing or implementing Find Me Pull Printing to eliminate unnecessary or duplicate copies being made. Cutting down on the amount of unnecessary printing can contribute to less money being spent not just on paper, but also toner. According to research by the NSW Environmental Protection Authority, more than one in two (53%) businesses agree that efficient waste management and recycling gives them a competitive edge. Increases efficiency: Sustainable practices can often lead to greater efficiency. For example, introducing a document management system with digital workflows that eliminate the need to print out documents will not only help to reduce paper consumption, but also lead to greater accuracy and faster processing times. Makes company more attractive to customers: According to a Nielsen study, 66% of consumers say they are willing to pay more for sustainable brands. Reflecting corporate sustainability can therefore make you stand out from your competitors and make your customers more loyal, leading to higher long-term profits. Leads to better customer service: A corporate recycling program can even result in a better service for customers. At KYOCERA, for example, we provide a machine recycling program, which includes pick-up of a printers, copiers or MFDs from customers’ site, as part of our commitment to environmental care. Not only does help to prevent toxic e-waste from going to landfills, but it also provides an easy and convenient disposal service to our customers. A recycling program demonstrates that a business is serious about corporate sustainability, which is important not just to customers, but to current and potential employees, thereby increasing a business’s ability to attract top talent. An increasing number of government and other tenders also require evidence of environmentally sustainable practices, which a recycling contract can help to provide, thereby helping businesses win more contracts. According to a Planet Ark report, 80% of employees reported that having recycling facilities makes them feel that they work for a responsible employer. A recycling program can therefore help lower employee turnover, saving the business significant costs associated with recruitment. Recycling, therefore, has substantially environmental benefits that could significantly help reduce a business’s environmental footprint. Take a close look at the products you use and see whether you can switch to suppliers that use recycled materials. At KYOCERA, for example, our packaging is made from 100% recycled, all-paper construction, and uses only vegetable and soy dyes in the printing process, so it is safe for the environment. Sustainability will be an important measure of success for workplaces of the future. To find out how you can drive down costs while saving the environment, download our Green Office Guide.